Oh my post is late today! Guess because I slept in this morning. I don't think I have done Hello Kitty in any traditional colors so I figure why start now! *okie laughs and wonders if she has a traditional bone in her body...and decides it is probably the ones with arthritis* I know some of you might remember this sunflower paper. I have used it on quite a few cards and that is because I love it! I am almost out and will be sad when it is gone. It is by Pinecone Press. 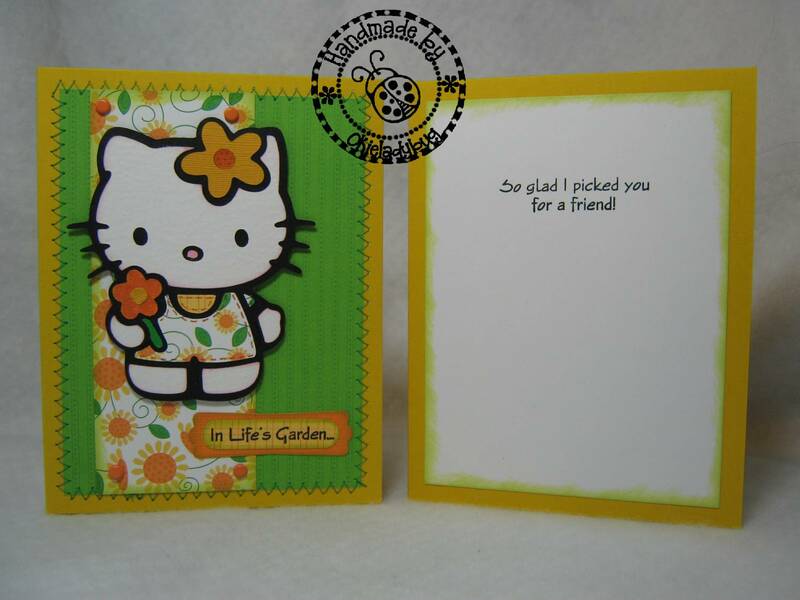 The cardstock is Stampin Up Summer Sun I believe. 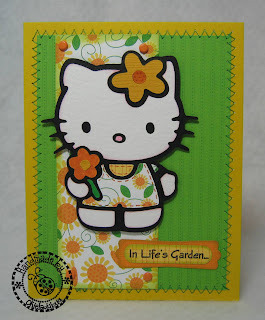 The sentiment on this card I used a stamp set I have used before also. I got the stamp set probably close to two years ago at Hobby Lobby and the company that makes it is no longer in business which is too bad since they did have really nice stamps. I believe the company was called See D's stamps or Sugarloaf. I thought the sentiment went well with the paper. 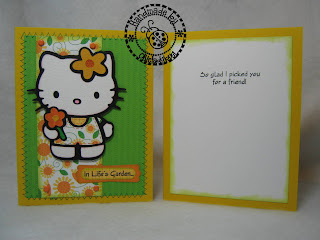 I used the Stampin Up Word Window and Modern Label punches for the sentiment on the front. Those punches are great for small sentiments and make them stand out a lot more than if you just stamped directly on the card. And yes, I did do stitching again! I just can't even tell you guys how easy it is to use that Janome Sew-Mini and it stores so easily. I can't remember who posted a comment about using "invisible thread" for the bobbin so you don't have to switch colors but THANK YOU! I did have some nylon thread and even had some on a bobbin. It is making it much easier to switch out colors because I am not having to switch my bobbin now. I messed up on the flower centers so I just did some coloring to the flowers to get them how I wanted. As I always say... There are no mistakes in paper crafting, there are only creative opportunities! Be sure to check back tomorrow for the cut file and gypsy file for this card and tomorrow's card! Very cute Okie! I have to make one like this for my H Kitty lovin neice! Thanks for the inspiration! Adorable card. When I read your post on the cc mb I just had to come see what Okie was doing with this cart, It's one of my favs. Great Job, do you have my addy?lol. I love your cards. I really like that your not using traditional colours. I love the brightness of this one!!! Okie, how is it that you take pictures of outside and inside at the same time? ie first picture? I love the zig zagging! Gaby I cut the card in half and then tape it back together. TOTALLY KIDDIN!! LOL I always make 4-6 of the same card. I use to make one but then would get upset because if I really liked the card I didn't have another one. This way I can make multiples and not have to go back and recreate it. It is also nice having them all in Design Studio so I can cut them again if I want. I love it, and the sentiment is great. You are making me want to learn how to stitch!! The card is perfect!! Thanks Okie for sharing it with us! Now To go write done to get me some of that Bobbin thread..
Okie, what a cute card! So adorable!! I want that Sew Mini so bad just because of your cards!! You've inspired me! I'm going to have to pull out this cart and create something with it again. I love the colors of this terrific card. TFS! I also love the quote at the end of your post. Oh this lil Hello Kitty card is just so darn CUTE! Great colors too ... and just look at that stitching. I think maybe she picked that pretty flower just for me. After all, I know lil Kitty must know that yellow is my favorite color!